On this episode we discuss the challenges and triumphs in Anglicanism in early America, by way of the narrative in the book One, Catholic, and Apostolic: Samuel Seabury and the Early Episcopal Church by Paul V. Marshall (2000). What were the Anglicans like when the American republic was formed? Did there exist challenges to orthodoxy then, and how were they resolved? We follow the book in looking at two foundational figures: Samuel Seabury and William White, destined to be on the opposite sides of history. As the latter sought to diminish Anglican distinctives to merge with the Presbyterians and Arians of New England, the former acted as the champion of orthodoxy, in the end prevailing, and leading to the establishment of the early Episcopal Church. Paul V. Marshall, One, Catholic, and Apostolic: Samuel Seabury and the Early Episcopal Church (2000). We did not sufficiently distinguish between Samuel Seabury (the convert under Johnson) and his son of the same name, who went on to become the first bishop of the Episcopal Church. Window in St. James Episcopal Church, New London. 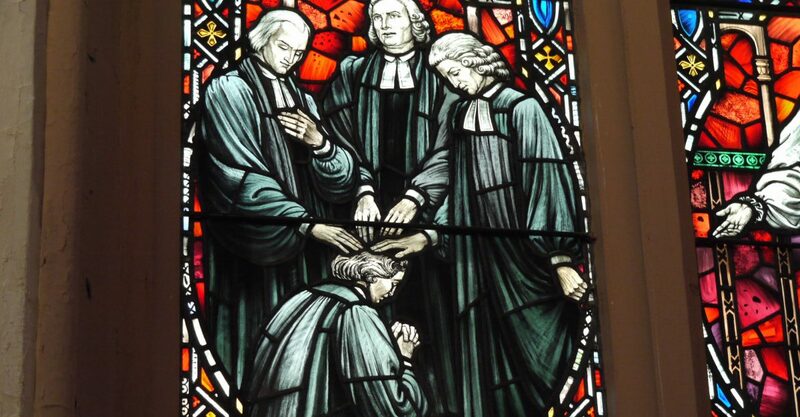 The consecration of Samuel Seabury by Robert Kilgour (Primus), Arthur Petrie, and John Skinner.